Description: Purchased by a sworn member who has undergone the 40 hour Carbine Qualification Certification course of instruction. Description: Worn by Department members to show support for fallen officers and to recognize their donation to the Chicago Police Memorial Foundation. To make a donation to the Chicago Police Memorial Foundation click on the image above. 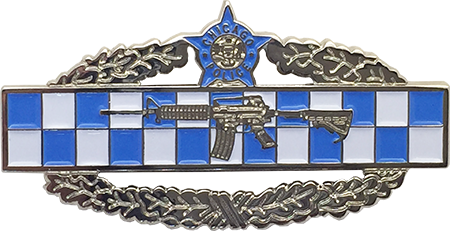 Description: Worn by members of the Chicago Police Peer Support Program. Material: Cloisonne’ over a base metal with a royal blue enamel background with gold letters and borders. Dimensions: The badge will be oval in shape and have a length of 1 inch wide by 1/2 inch high with a thickness of 1/16 of an inch. 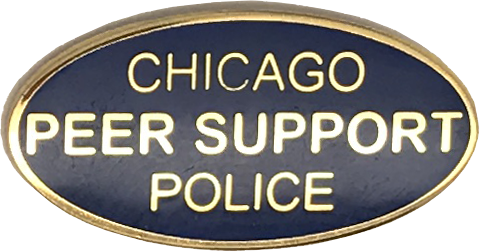 Lettering: In Arial, each letter spelling “PEER SUPPORT” will be 3/16 of an inch high and each letter spelling “Chicago Police” will be 2/16 of an inch high. Attaching Device: A clutch stud will be attached to base of the nameplate by the swagging method to ensure hardness of the base and strength of the stud. The stud length may vary from a minimum of 5/16 inch to a maximum of 1/2 inch with three position grooves. Clutch studs will be centered on the reverse side of plate. Description: Worn by Department members currently assigned to pilot duties as a Chicago Police Officer. The pilot wings will be worn centered and above the nameplate / unit designator and Department award ribbons, if applicable. Material: Polished Chrome over a base metal. The pilot wings will be constructed of at least two pieces: a wing backing and a Chicago Police “Police Officer” star emblem attached between and in front of the wings. The Chicago Police star emblem will be permanently attached with an adhesive. Dimensions: The wings will measure 3 inches wide by 1 inch high. Color: The Chicago city seal will be appropriately colored in enamel, and the words “Police Officer” and “Chicago Police” will be colored in black enamel. All remaining exposed surfaces of the pilot wings will be silver in color and have a high-gloss finish. Finish: Polished Silver. All exposed surfaces of the pilot wings will have a high-gloss finish. Attaching Device: A clutch stud will be attached to back near the tip of each wingtip. The stud length may vary from a minimum of 5/16 inch to a maximum of 1/2 inch with three position grooves. 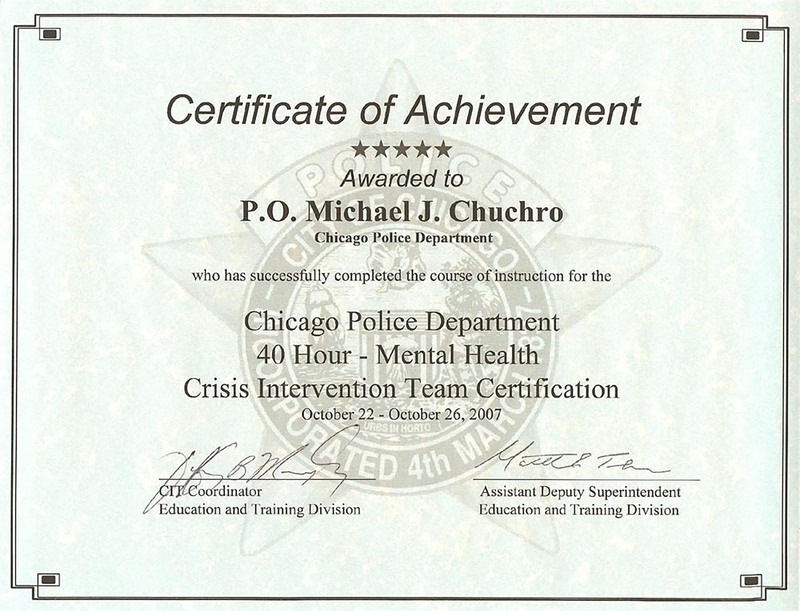 Description: Presented to a Sworn Department Members who have undergone the 40 hour Mental Health Crisis Intervention Team State Certification course of instruction. Presentation: This bar is presented to Sworn Department Members in the form of the Crisis Intervention Team Bar and certificate.